The purpose of the coolant is to carry heat away from the engine. The correct amount of anti-freeze is important to prevent the cooling system from freezing in winter. The cooling system is filled for life at the factory, so the coolant does not need to be changed. The coolant consists of a mixture of water and anti-freeze additive G12++. This is a glycol-based anti-freeze with anti-corrosion additives. The amount of anti-freeze additive required depends on the temperatures to be expected in the winter season. If the anti-freeze concentration is too low the coolant can freeze, resulting in failure of the cooling system and heater. The cooling system is filled at the factory with the correct amount of anti-freeze for the country concerned. In most cases the mixture consists of 60% water and 40% additive. This mixture gives the required anti-freeze protection at temperatures down to -25 °C and protects the alloy parts of the cooling system against corrosion. It also prevents scaling and raises the boiling point of the coolant. The coolant concentration must not be reduced by adding plain water, even in the summer or in warm climates. The concentration of the anti-freeze additive must always be at least 40%. If greater anti-freeze protection is required in very cold climates, the proportion of the anti-freeze additive G12++ can be increased. A concentration of 60% offers protection down to about - 40 °C. The concentration of the anti-freeze additive must not be more than 60%, otherwise this would reduce the anti-freeze protection. In addition, the cooling effect will be adversely affected. Vehicles for export to countries with a cold climate (such as Sweden, Norway and Finland) are supplied with antifreeze protection down to about -35 °C. The concentration of the antifreeze additive for these countries should always be at least 50%. • It is advisable to have the cooling system checked before the winter season to make sure that the antifreeze concentration is adequate for the conditions to be expected. This applies particularly if you intend to take the car into a colder climate zone. If necessary, have the anti-freeze concentration increased to 50 - 60% as required. • Use only anti-freeze additive G12++, an additive meeting the specification “TL 774 G”. Other additives may give considerably inferior corrosion protection. The resulting corrosion in the cooling system can lead to a loss of coolant, causing serious damage to the engine. • The coolant additive G12++ can be mixed only with additives G12+ and G12. The coolant level can be checked at a glance. – Read off coolant level on radiator expansion tank ⇒ fig. 257. When the engine is cold it should be between the “MIN” and “MAX” marks. When the engine is hot it may be slightly above the “MAX” mark. The coolant level should be checked with the engine switched off. The coolant level is monitored by a warning lamp in the instrument cluster ⇒ page 33. However, we recommend that it should be checked occasionally. Any loss of coolant normally indicates a leak in the cooling system. In this case the cooling system should be inspected by a qualified workshop without delay. It is not sufficient merely to top up the coolant. If there are no leaks in the system, a loss of coolant can only occur if the coolant boils and is forced out of the system as a result of overheating. Radiator sealants must not be added to the coolant. Such additives could seriously impair the function of the cooling system. Be careful when topping up coolant. – Switch off the engine. – Wait for the engine to cool down. – Cover the cap on the expansion tank ⇒ fig. 257 with a cloth, and carefully unscrew the cap anti-clockwise ⇒ . – Screw the cap on again tightly. Make sure that the coolant meets the required specifications, “Coolant”. Do not use a different type of additive if antifreeze additive G12++, G12+ or G12 is not available. In this case use only water and bring the coolant concentration back up to the correct level as soon as possible by putting in the specified additive. Always top up with fresh, unused coolant. Do not fill above the “MAX” mark. 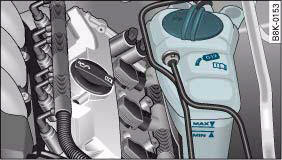 Excess coolant is forced out of the system through the valve in the filler cap when the engine gets hot. If a lot of coolant has been lost, wait for the engine to cool down before putting in cold coolant. Failure to do so could result in serious engine damage. • The coolant and coolant additive can be a health hazard. Store the coolant additive in the original container in a safe place out of reach of children – risk of poisoning. Drained off coolant should not be used again. Drain off the used coolant into a suitable container and dispose of it in the proper manner (observe environmental regulations). The radiator fan can start running spontaneously. The radiator fan is driven by the engine via a poly V-belt. The speed of the fan is varied by a viscous clutch according to the temperature. There is also an auxiliary electric fan, which cuts in automatically whenever the temperature of the coolant and the engine compartment rises above a certain level. • the hot engine compartment is additionally heated up by the sun. When working in the engine compartment be aware that the radiator fan may start running suddenly – risk of injury.